Rallies like the one on Sunday are places where we can have sensible conversations about drug law reform. The kinds of conversation we should also be having in our Parliament. Public events and festivals are a big part of what Sydney is about—events where young people can go out and safety have a bit of fun. But that’s not what happens in NSW. When young people go out in NSW they too often are faced with an aggressive police response, a barrage of drug dogs and once you get past the dogs and inside events or venues there are undercover police and often also a heavy uniformed police presence. The last few music festivals in NSW have had the heaviest police presence ever seen at any time in this country and it has backfired terribly. The result has been a sharp reduction in safety and the tragic outcome of lives lost. This is because when young people head towards the entrance of a music festival and see a bunch of drug dogs and police this can cause them to panic, and in that panic they may ingest any drugs they are carrying. We know people’s lives have been lost following overdoses in such circumstances. The Government in NSW has recently made it an offence to supply a drug to a friend, meaning that if a young person is in distress young people are anxious about even going and seeking medical assistance in case they or their friends are followed by the police. We know that this is delaying access to health treatment. We also know that young people are anxious about seeking help at music festivals because if they mention they have been anywhere near drugs they will be thrown out on the zero tolerance approach that the Premier has taken. The deadly policy being adopted by this Government is costing people’s lives. We say test the pills, put in the amnesty bins, get rid of the drug dogs, stop the war on young people, stop the war on fun. It’s time we made this place safe for young people. This is a war on people and not drugs. Let’s be clear about who is under attack—it’s the same people under attack with every law and order approach. First Nations people, vulnerable people and young people. This is a war on young people by a bunch of geriatric politicians who would be better off on South Park than in the halls of power of any of our parliaments, state or federal. This movement is building. We are going to get pill testing. 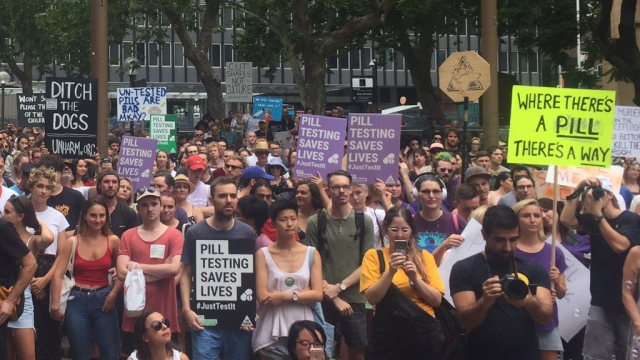 We’re going to achieve it because the overwhelming majority of people in this country want pill testing. Young people want the information to keep themselves safer. While we’re talking about pill testing, let’s get in there and legalise cannabis and let’s open the door to having a serious discussion about other drug law reform like regulated supply of MDMA.